Telegraphist Herbert Isaac Chase died while serving with the Royal Navy on HMS Caroline when the WWI era ship was based in Belfast, Co. Antrim in 1941. Herbert Isaac Chase was a Wireless Telegraphist in the Royal Navy. He served on board HMS Carolina based in Belfast, Co. Antrim at the time of his death in January 1941. Wireless Telegraphist Herbert Isaac Chase (D/J65192) served in the Royal Navy during World War Two. Born on 5th April 1900, he was the son of Thomas Henry Chase and Jessie W Chase (née Waugh) of Belfast, Co. Down. On 31st March 1901, the Irish census lists Herbert as an 11-month-old baby living with his parents and older brother Harold in Campbell Park Avenue, Belfast, Co. Down. By 2nd April 1911, Thomas, Harold, and Herbert (now referred to as Berty) are living as boarders at 5 Melrose Street, Belfast, Co. Antrim. Head of the household is John Donnelly and his with Mary Donnelly. Harold died a few years later on 28th April 1914. In 1926 Herbert married Nita Alberta Brebner Grinley in Devon, England. The couple later lived at 27 Joanmount Drive, Belfast, Co. Antrim. Imperial War Museum Photo: Q 74029 (Part of the Royal Navy 1914-1918 Collection). 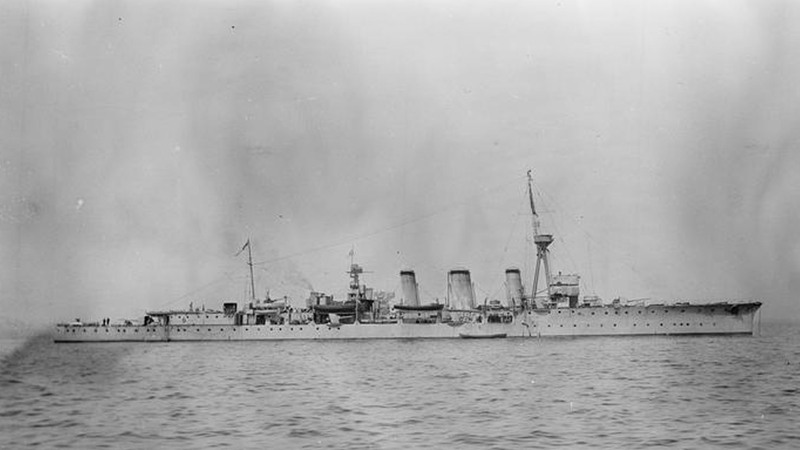 Light cruiser HMS Caroline in active service at Scapa Flow during The Great War. HMS Caroline is the last floating survivor of the Battle of Jutland and moored in Belfast. Copyright Royal Navy Photographer. On 4th May 1929, Herbert Isaac Chase is on board his first ship, the Emperor of India, serving with the Royal Navy. He would go on to serve on several different vessels throughout the pre-war years continuing to serve in the early years of the Second World War. Chase died at Royal Victoria Hospital, Belfast, Co. Antrim on 18th January 1941 aged 40 years old. His cause of death was a “cerebral haemorrhage”. At the time, he served on HMS Caroline based in Northern Ireland’s capital city. Herbert Isaac Chase’s grave is in Section AL, Grave 6 of Carnmoney Cemetery, Newtownabbey, Co. Antrim. If you enjoyed this post on "Herbert Isaac Chase", please share with your friends and followers.